Fairley's Folly!! Great Location! Lots to Do or Just Relax! This is one of the newest condominium buildings in Orange Beach! It is NOT a high-rise condo complex. Mariner Pass is a very low density and quality property with only 59 units total - it was built for those who did not want to be in a crowded complex with hundreds of other people and all the stress that accompanies those large crowds. There is a spacious Master Bedroom with a King Bed and a ensuite bath complete with a jetted tub big enough for two. You can sleep in and then watch our new flat panel tv in bed on a lazy morning. The master closet is the owners closet. Two Guests rooms are separated from the Master by living, dining and kitchen areas to allow for additional privacy. The kids will love the twin beds with the swing arm wall mount tv & DVD player. Relax around the pool with a cool beverage and a good book, dine on the lanai while you watch the boats go by, take in the beautiful sunsets, then fish from the pier in the early evening. There is no boat slip with this rental. Beach access is just a drive over the bridge just out the door to one of the best State Park beaches anywhere. You can even bring your bicycle, rack it in the bike racks in the covered parking area and can ride in the bike lanes up and down Perdido Key drive. There's Publix, Winn-Dixie, & Wal-Mart Fresh Market grocery stores all just a short ride down the street ... the state has built a great bike path through a wildlife area just minutes away as well. If you’re looking for some off-property excursions, there are many to choose from, starting with a walk to San Roc Cay Marina, where you can find unique courtyard events, shopping, lots of dining, and pampering opportunities, spending the day on the water enjoying dolphin cruises, deep sea fishing, snorkeling, diving, parasailing, and jet skiing. And for the golf-lovers, Gulf Shores is also known for their premiere golf courses, including Lost Keys Golf Club, Craft Farms, Cotton Creek Course and Peninsula Golf and Racquet Club to name just a few. Finally, for kids of all ages, there is the tallest Ferris Wheel in the Southeast at a height of 112 feet, located at The Wharf in Orange Beach; Waterville for some wild and wet fun, and the Gulf Coast Zoo. There is only ONE parking pass for this condo at $35.00 a stay. There is not a boat slip available with this condo rental. 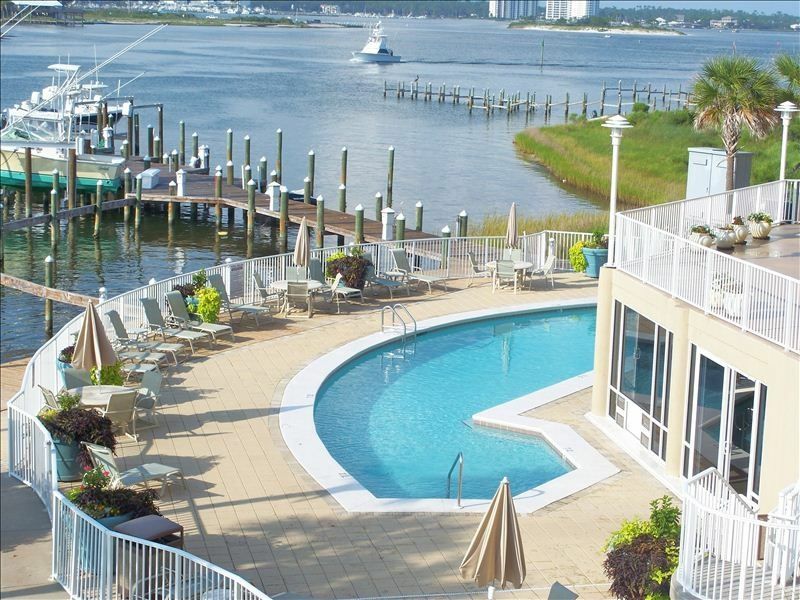 - Large private balcony - see dolphins swim by & watch boats! -Snowbirds are very Welcome here. While growing up, our families spent most of our summer vacations in the Orange Beach area. As adults, my husband and I have always wanted to own a condo that we could spend our summer vacations at with our children. We purchased this condo in August of 2011 and we have made so many memories in this short amount of time. We hope you will also make great memories while here at Mariner Pass. Dolphins swim by daily. One of the closest condos in all of Orange Beach to the pass to the Gulf of Mexico for instant access to the Gulf, Robinson Island, and speckled trout fishing beneath the bridge, and rafting up at Robinson Island (which can also be seen in the distance from the balcony); Cotton Bayou and Boggy Point boat launches are only minutes away from Mariner Pass. San Roc Cay Upscale shopping, family and high end restaurants, marina, live music on weekends in the courtyard, children's play area, etc. Within short walking distance of Mariner Pass condo. Steam room, sauna, exercise room, all amenities handicapped accessible. Large grassy play area for outdoor games and a community beach area between Mariner Pass and The Pass. Fishing from 2 piers at the private Marina. Great location and comfortable condo! We had a great time staying here! It was roomy and perfect for our family. We loved the view and could see dolphins swimming in the mornings from our deck. I would definitely stay here again! This is a really nice condo, very clean and great view over the marina in back. At first I was sad we had not found a unit overlooking the gulf, but after a few hours at a gulf beach where the “June grass” - massive amounts of slimy algae that comes in from the gulf to the beach in summer - I was really glad to be overlooking the bayou/back bay instead! My grandson especially enjoyed watching the boats go by from the large back deck and swimming in the pool. We even used the BBQ one night. I would really recommend this unit. The owner is very responsive and easy to work with! Convenient location and clean condo. We enjoyed the pool and being so near the marina. Exactly as described! Very clean and spacious. We love the location. Clean, spacious, quiet, and great location!! We will go back!! Great stay! Condo was great, we’ll equipped, clean with all needed essentials on hand. Quick response from owner when questions arose. Very supportive! Beautiful Condo. Will be renting this unit again. Beautiful unit. Loved watching the sunsets from the spacious balcony. Will definitely be renting this unit again.